Online video slots have always been at the center of attention at UK online casinos. Table and card games such as Blackjack, Roulette and Baccarat have a strong foothold as well, but the best online slots clearly dominate the casino game libraries. If you’re here, you’re probably a passionate slot player who likes to get the best chances at winning, at the best slots casinos, playing the most popular video slots! We’re not saying you should forget your favourite slot games. We just want you to consider a few of our top picks, which are based on close and thorough statistics, common sense and most importantly, the voice of the slot players! First, we’re going to show you what the best slots sites in the UK are, and then we’re going to talk about the best slot games the UK online casinos have to offer! The casinos listed above have all proven their worth, by demonstrating integrity, continuous improvement and their operations are in line with the guidelines laid out by the UK Gambling Commission. However, if you want to learn more about this, you should check our other pages. This page’s topic is online slots! What is an Online Classic Slot? 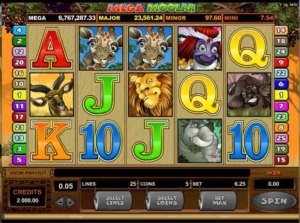 Whilst open to interpretation, a Classic Slot at the best online casinos, tends to be a slot game that mimics more of a land-based or mechanical slot machine. What does this mean? Generally, it means fewer paylines, lower jackpots, and fewer bonus rounds, whilst retaining that classic and retro look. 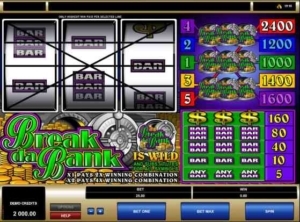 A good example of the best classiv slots would be Microgaming's ‘Break Da Bank'. The modern version of a Classic Slot, Video Slots offer better visuals, bigger and more interesting bonus-rounds, multiple paylines and much bigger jackpots. These days, you are going to find tons of video slots at every online casino. Recent examples of the best video slots would be Starburst or Gonzo's Quest. Loved by everyone, Progressive Jackpot Slots are basically video slots where the jackpot (or jackpots) grow as more people play them. Hence, the term ‘progressive', as the jackpot grows and grows until someone wins it. Some great examples of the best progressive jackpots would be Mega Fortune, Mega Millions and Mega Moolah. Interestingly, with progressive jackpots, they are fed into from multiple casinos. So whether you played Mega Fortune at Casino A, Casino B, or Casino C, you'd still benefit from the same jackpot prize – everyone playing the game feeds into it. This has seen world record casino jackpots paid out to UK online casino players. What Makes an Online Video Slot Popular? Before we dwell on the greatest slot hits among UK slot players, we’d like to point out a few features, a few traits which can make a slot reach the top of the popularity lists of online casinos. Believe it or not, the RTP (Return to Player) doesn’t have much to do with it. Sure, it’s a factor, but only to video slot players who prefer wins in the long run, more than fun right now! In general, there are 4 criteria which slot games must meet in order to become and stay popular. Distinctive Feature (at least ONE) – Free spins, a pick and click game, twin reels, avalanche feature, these are just some examples of what we mean by distinctive feature. If you look closely, all of the popular games have one, or at most, two bonus features. 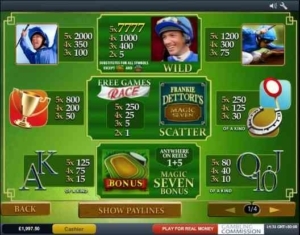 Slot games with a range of bonus features end up confusing players with complex paytables. Mobile Compatibility – Mobile casino players are the majority! There are players who still play on desktop, but the data shows that mobile slots are the big thing. If a game is not mobile-friendly, it’s doomed to fail, and end up at the bottom of the slots lists. Free Spins Offers and Bonuses– Surprised to see this again? Well, we don’t mean Free Spins that are part of the game, rather free spins bonus deals offered by the casino. Take for instance Starburst or Book of Dead, they are the casino favourites when it comes to free spins offers. It’s by no accident that they’re players’ favourites as well! Gameplay, Not Graphics – The video quality works up to a certain point, but gameplay is what matters. How the reels spin? How the triggering symbols interact? Is the hit rate high or flow? These are way more important than the graphics. They have the biggest impact on the player’s experience. With the factors in place, we can now move on to the best slots online in the UK from the best slots providers! When it comes to the best online slots, you've got to first look at the software companies that produce them. Historically it's been a battle between the big boys such as Microgaming, Playtech, and Net Ent, but there are now so many providers that you really are spoilt for choice. With the likes of Thunderkick, Play n Go, Greentube and NYX snapping at the heels of the big boys and providing great online slots, there's something available for every taste. Below, we take a closer look at some of the best online slots and best progressive jackpot slots by the bigger providers. So whether it's Play n Go's amazing ‘Book of Dead‘ slot or any of the below that you like, you'll find out plenty about them. Microgaming is a pioneering online casino game provider that’s been supplying online casinos with slots and table games for more than 20 years. If you’re into online gaming, you must’ve played some of their games, at the very least, their greatest hits. These play a vital role, and each of them is unique and serves a different purpose. One of Microgaming’s most popular creations ever, and arguably the one that’s most entertaining and with a high payout ratio, it’s Immortal Romance! Some find the music eerie, but we think it’s perfect. It suits the overall theme, telling the story of Amber, Troy, Michael and Sara. Many players don’t even know their names, yet they’ve thanked them for their big and mega wins. However, the paytable is complex, yet it shouldn’t take you long to realize which Free Spins you should look forward to. The RTP is high for Microgaming’s standards, but we can’t really match it with other high paying slots online. 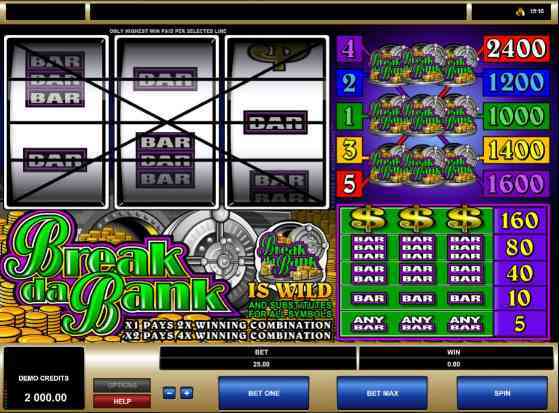 Dubbed as one of the best slots for wagering purposes, Break da Bank Again is a refreshment of its 3 reeled predecessor, Break da Bank. 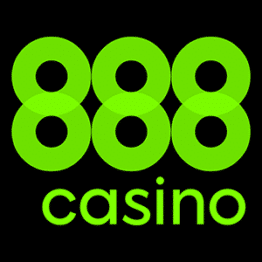 The slot features 5 reels and 9 paylines with an RTP of 95.43%. 3 or more vault symbols trigger the bonus game with up to 25 free spins, while hitting 5 diamonds symbols triggers the jackpot valued at 1500 coins. This video slot is a perfect fit if you are looking to maintain your bankroll at a steady pace, with the side possibility of winning big thanks to the bonus game and jackpot. The RTP is below average, yet Break da Bank still ranks high! Unless you’ve joined the online gaming community recently, you are aware of the impact Mega Moolah has had in the past few years! It cemented jackpot slots, guaranteed their presence on the landing pages of online casinos. The record-breaking jackpot, which went to a UK veteran made Microgaming famous even among people who have never visited an online casino. The hit rate is lower than average though, and the payouts are average at best. However, the looming opportunity to land that 7 or 8 digit jackpot is thrilling enough by itself. NetEnt is Microgaming’s fiercest rivals, especially in the UK. Frankly speaking, in certain markets NetEnt comes on top, but when it comes to the UK, the victor is not easy to identify. Its recent releases feature cutting-edge graphics that are hard to match. However, they also feature simple, yet rewarding bonus features. A slot which needs no introduction, Starburst by NetEnt has topped the lists since its introduction! It’s highly likely that you’ve seen even seen a TV ad for some online casino featuring 20 Starburst Sign Up Free Spins, aka 20 Starburst No Deposit Spins. The distinctive feature is called Rainbow Reels, and you will never get bored of it! The audio is slowly becoming outdated, but veteran players don’t mind, obviously. There’s a divided opinion, that it’s only popular because casinos are so aggressively promoting it, and featuring it in sign-up offers. We tend to disagree. The Starburst slot has been the stepping stone for many now passionate slot players. You don’t have to look long to find a casino which offers Starburst, it’s literally everywhere! When we talk about Gonzo’s Quest, we’re talking about a NetEnt flagship product. This video slot has nothing but praise amongst casino players worldwide. While some NetEnt products have come to disappoint over the years, some have proven to be pure gold – such is the case of Gonzo. This NetEnt creation shakes up the foundations of video slots, by replacing the reel feature with an avalanche feature. As the symbols are set in place after a spin, they will be replaced by more falling symbols, increasing your chances of a winning combination as well as your multiplier. A bonus game is the only thing lacking in Gonzo’s Quest, but free spins are in place to quench your thirst for extra winning chances! Another clearly visible proof of NetEnt rivalry with Microgaming is Mega Fortune. It’s the equivalent of Mega Moolah in terms of the mind-boggling jackpot amounts. Now, we’re not saying you should chase the jackpot, you first must enjoy the game. However, jackpot slots are not that exciting, because you’re in them for the jackpot prize for the most part. And in all honesty, they don’t come with bonus games that are up to par with what regular video slots have in store for you. Needless to say, this isn’t a problem for the so-called jackpot hunters. They’re all about the life changing prize, which will put them next to lottery winners, and will propel them into the world of millionaires! Playtech has a unique backstory, and a clearly defined selection of clients. You can see their slots in the casino section of sports betting giants like Ladbrokes, bet365, William Hill and Betfair among few others. That being said, Playtech can single-handedly set in motion an entire online casino, providing slots, table games and live casino games. In regards to slots, a few years ago, they had the most popular line of jackpot slots, featuring Marvel superheroes, like Iron Man, Thor, Captain America and all of them were a direct depiction of the recent Marvel movie releases. The secret to their success, a rapidly increasing jackpot. Since they were at the top of the lists, and there were a lot of Marvel-themed jackpot games, a lot of players were playing them, which made the jackpot skyrocket in a matter of a few days. However, due to Disney’s policy, Playtech lost the license to the characters, which meant they had to remove them altogether. Then again, not all is lost. Playtech reacted immediately following the announcement that we have to say goodbye to the most popular Marvel slots. Age of the Gods is the direct equivalent of the Marvel Avengers slots. Most of the bonus features and the bonus games are the same, with only the protagonist being replaced with a god from Greek mythology, at least that’s how they look to us. The Age of the Gods line of slots successfully filled the void made with the removal of Marvel slots. However, it didn’t stop here. 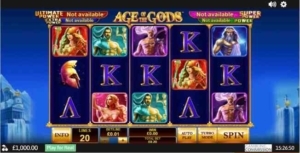 Soon after, Playtech introduced an Age of the Gods Live Roulette as well. In our opinion, Playtech’s slots, including Age of the Gods jackpot slots, are as successful solely because of their positioning. They come as complementary products to the much sought after sportsbooks. Which leads us to the next Playtech slot! Online casino game providers are versatile, and thanks to advanced technology, it’s easy for them to put on the reels anything that the player would like to see. 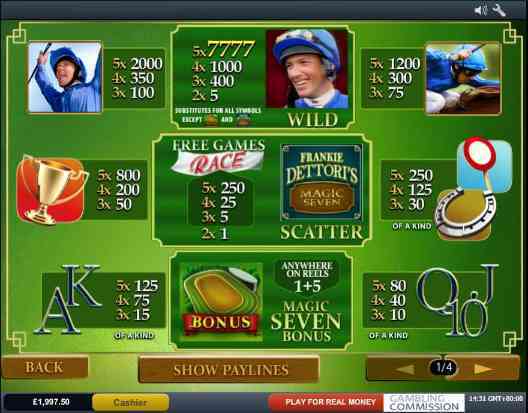 Frankie Dettori, a horse racing legend, so big that he got his very own video slot. And not just a regular slot, but a progressive jackpot slot! For a regular casino player, who’s not into betting, this particular game is not of any interest. However, thanks to the attention it gets from horse racing and sports betting, it’s common to see at the top of the online slot lists at the renowned online casinos and sportsbooks mentioned above. Some of you might be simply looking for the best online slots with the highest payout percentage. After all, we’re all into slots for the wins! However, before we list the best payout slots online, we’d like to discuss two very different, yet closely related slot parameters. Return to Player (RTP) – It’s the overall, theoretical return to players, meaning the percentage of the money that goes back to real money slot players. RTP must not be underestimated if you’re planning on playing the game longer than usual. That’s when RTP kicks in. However, when we say a long time, we mean it. Win Hit Rate – In simple words, this is the win frequency, meaning how often do you see mesmerizing graphics and enticing audio effects, and your balance goes up. The key point to note is that high win rate does not mean high RTP. You can get tons of small wins, but still not break even. With these two explained, we can now move on to the best payout online slots, in terms of HIGH RTP. Drum roll… The top 3 slots with the highest TRTP (Theoretical Return to Player) come from NetEnt and Thunderkick. As a matter of fact, two of the highest RTP slots online belong to the Swedish NetEnt. Blood Suckers (98%) – Blood Suckers, including the next two slots are usually not allowed for wagering requirements, mainly because they come with so high RTPs. Specifically, Blood Suckers was so popular it got a sequel, Blood Suckers II, featuring modern graphics, updated bonus features, which combined, make the gameplay 10 times better. However, it can’t match the high RTP of the initial Blood Sucker slots. Blood Suckers, like Starburst and Mega Fortune, keep NetEnt “on the igaming map”. 1429 Uncharted Seas (98.5%) – Don’t let the “gray” tone fool you. With 98.5% RTP, 1429 Uncharted Seas slot is among the highest paying slots online! Besides the Wild symbol, it also comes with a bonus game which will surely keep on your toes. Mega Joker (99%) – The highest paying slot, coming from the house of NetEnt is Mega Joker. Many of you will be disappointed by the looks of Mega Joker. It’s a 3 Reel classic slot, but as the RTP says, it’s extremely generous. However, if you’re a casual player, we recommend Blood Suckers over Mega Joker. It’s better in all aspects, and the difference of 1% in RTP is not that bad. New Online Slots – What to Expect? Take them for a test spin, that’s the least you can do. They’re usually hit or miss, and in spite of the aggressive promotion, most of the best online slots players find it hard to let go of their favourites. Nowadays, instead of producing high paying slots, online casino game studios focus on the graphics and the gameplay. This is another reason why you should stay on the lookout for casino promotions, casino bonuses, and free spins. They’re a no-brainer!